Having systematically monitored wild animals killed on the Brazilian federal highway BR-262, which passes through the Pantanal region, a research team from the Federal University of Mato Grosso do Sul, Brazil, published their data concerning birds and reptiles in the open access journal Check List. Apart from information crucial for future conservation activities, the paper provides new and unexpected roadkill records, including the Black-and-white hawk-eagle. Authored by Wagner Fischer and his colleagues Raquel Faria de Godoi and Antonio Conceição Paranhos Filho, the article is part of the first dataset of vertebrate mortality in the region. A separate paper of theirs is planned to present the data concerning mammals gathered during the same survey, which took place between 1996 and 2000. An adult individual of Xenodon matogrossensis captured in roadside habitats of BR-262. Photo by Cyntia Santos. Having mapped bird and reptile roadkill on the highway between the cities of Campo Grande and Corumbá in the Brazilian savannah, the team reports a total of 930 animals representing 29 reptile and 47 bird species. 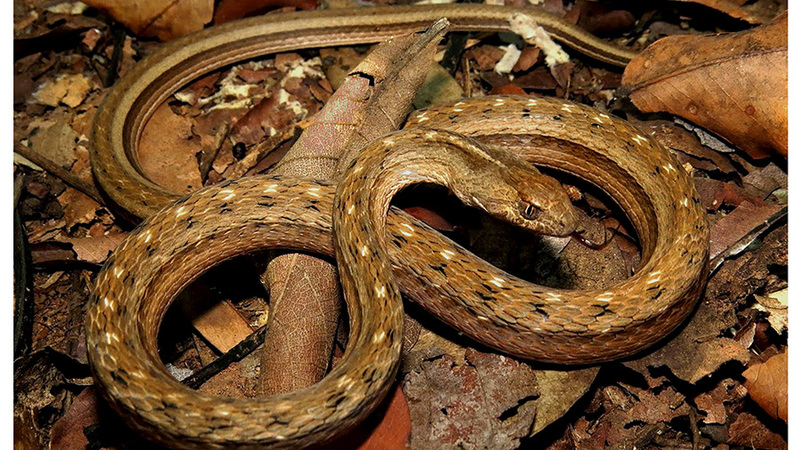 In addition, the data provide the first regional geographic record of the colubrid snake Hydrodynastes bicinctus. The researchers conclude that the species richness observed in the road-killed animals clearly confirms earlier concerns about wildlife-vehicle collisions in the Pantanal region. Such accidents lead to long-term and chronic impact on both wildlife and road safety. “Mitigation of wildlife-vehicle collisions on this road continues to claim urgency for biodiversity conservation and for human and animal safety and care,” say the authors. In the past, the team’s dataset had already been used as a guide to road fauna management. In particular, it was used by government road managers when planning animal overpassess and underpassess equipped with roadside fences as part of the long-term project Programa Estrada Viva: BR-262. So far, however, only some of the less efficient safety methods, such as road signs and lowered speed limits, have been applied at the most critical points. Over the past several years, a few independent studies have been conducted to monitor roadkill in a similar manner. Two of them (2010 and 2017) looked into mammal-vehicle collisions, while the third recorded reptiles and birds as well. All of them serve to demonstrate that BR-262 continues to be a major cause for the regional wildlife mortality, which in turn increases the risks of serious accidents. “BR-262 keeps its inglorious fame as a highway to hell for human and wild lives,” points out lead author Wagner Fischer. Roadkill on the BR-262 highway, Pantanal region, Brazil. Photos by Ricardo Fraga and Wagner Fischer.